Illah Nourbakhsh remembers the first time he spoke in Davos, Switzerland, at the World Economic Forum. It was 2014, and the topic was the ethics of artificial intelligence. After his talk, Nourbakhsh approached a forum organizer and mentioned that Carnegie Mellon University's CREATE Lab had developed a tool called Earth Timelapse. He wondered if the technology, which created interactive images of the world, might be useful at the forum to show global trends over time. After all, Davos annually brings together politicians, corporate leaders and policymakers to shape global, regional and industry agendas. He was asked to bring the tool to the forum's annual meeting in China — Annual Meeting of the New Champions — but only as an experiment. "They told me, 'this technology is really cool, but things only happen once here because we need to keep things fresh and new every year,'" Nourbakhsh recalled. "We were supposed to be one-and-done." They weren't. Earth Timelapse mesmerized attendees, taking massive datasets and visualizing them in ways never seen before. Attendees could zoom in on countries to see the effects of deforestation over a 20-year timespan. They could watch as coral reefs bleached and died in oceans around the world. Carnegie Mellon University's Randy Sargent demonstrates the growth of cities in America and the People's Republic of China using EarthTime, a CMU tool that visualizes large data sets. 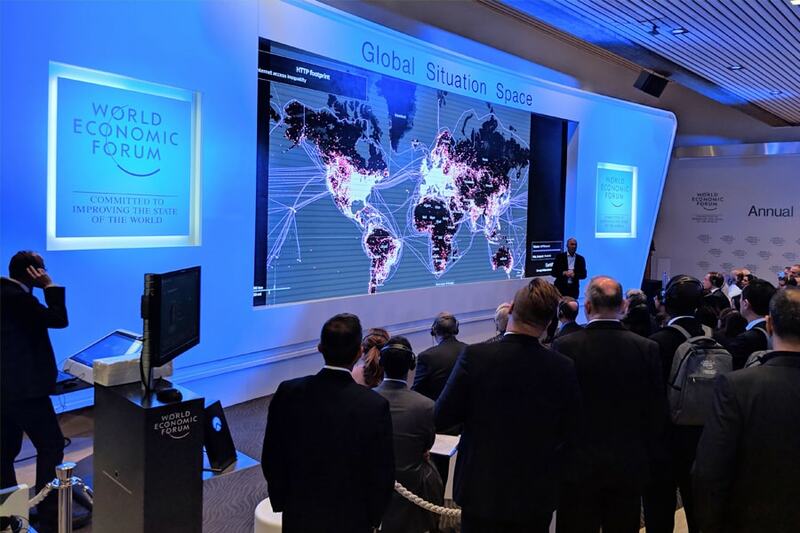 The CREATE Lab was then asked to bring the technology to Davos in 2015 with a warning that it would be the group's only trip to the exclusive forum. 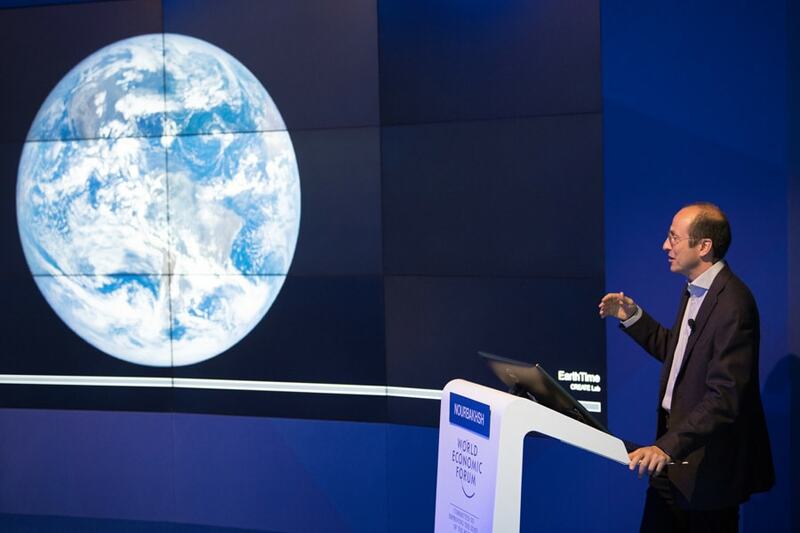 The 2019 forum will make five years in a row in Davos for the technology, which is now billed as EarthTime. Again this month, internationally respected policymakers and business leaders will stand in front of a massive 25-foot monitor in the central foyer of the Davos Congress Centre, using Carnegie Mellon software to tell the narrative of the planet's most important stories. This year it will highlight the fate of our oceans, the warming of the planet and women in the workplace, among other topics. 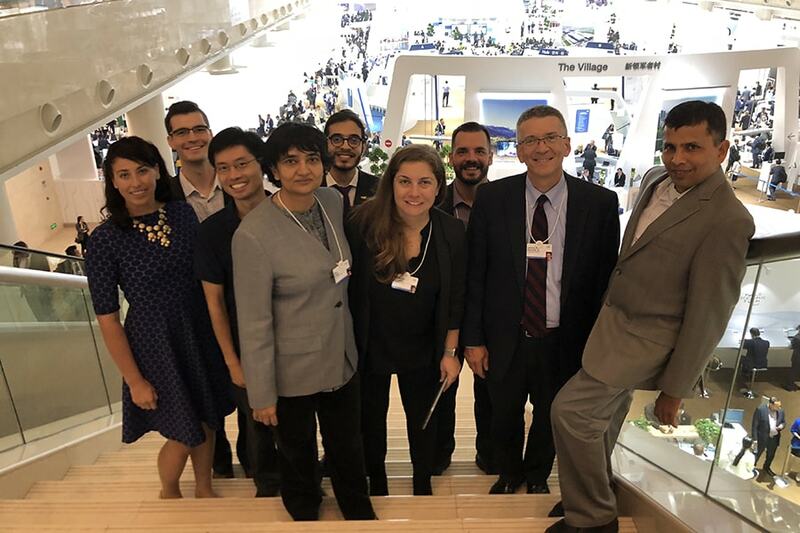 Carnegie Mellon University's CREATE Lab has showcased evolving technology that shows global trends over time at the World Economic Forum since 2015. The team behind the technology includes Randy Sargent, Paul Dille, Illah Nourbakhsh and Gabriel O'Donnell. "EarthTime, via the forum, allows Carnegie Mellon to sit at the table, on equal footing, with groups such as the United Nations Human Rights Commission to contribute and collaborate," said Gabriel O'Donnell, principal research programmer in CMU's CREATE Lab, which oversees EarthTime. O'Donnell, Nourbakhsh and Randy Sargent will all head to Switzerland for the forum. They recently attended the meeting in China for the fourth time. "It's fascinating to see the reactions," said Sargent, a researcher at CREATE Lab. "World leaders sit down on those stools for the presentations and we hear their audible gasps — those aha moments — throughout the week." One year, the president of Mongolia walked over to Sargent and asked to zoom in on his country to look at climate patterns and energy trends. "He asked direct questions and we were able to give him the answers using an interactive and accessible method — information that he could use to help his citizens," Sargent said. Participants listen to the session "The Big Picture on Globalization" at the Annual Meeting 2019 of the World Economic Forum in Davos, Switzerland. The EarthTime display was created by Carnegie Mellon's CREATE Lab. The EarthTime team spent the first few years at the forum handing out hard drives to interested attendees who wanted to bring the software back to their home countries or businesses. Now the trio of researchers points Davos attendees to the EarthTime website. The annual visit to Switzerland typically results in a few new international partnerships for CREATE Lab. "Five years later, we're no longer a thing at the forum. We're a tool," Nourbakhsh said. "I like to think of our team as 21st century blacksmiths. We provide the tool that helps the most influential people in the world to make decisions that will impact the future of society and the future of our planet."